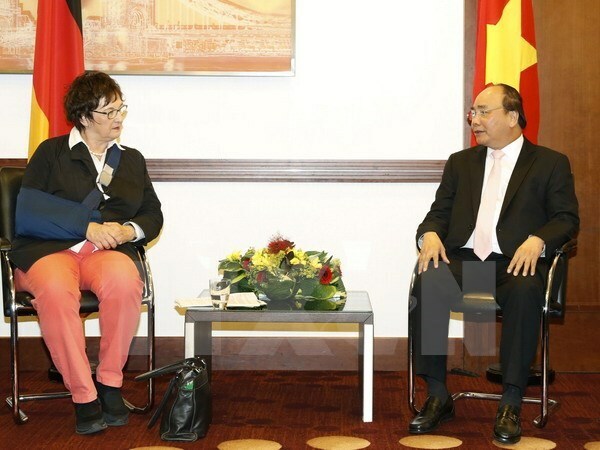 Berlin (VNA) – Federal Minister for Economic Affairs and Energy Brigitte Zypries said she will encourage German businesses to make more investment in Vietnam while meeting with Prime Minister Nguyen Xuan Phuc on July 6 as part of his ongoing official visit to Germany. The two sides discussed measures to increase trade and investment, especially in the field of energy. The Minister urged Vietnam and Germany to work to increase the bilateral trade to 15-20 billion EUR by 2020, especially when Vietnam and the EU are about to sign a free trade agreement. The two sides should also join hand to deploy the Fast Track mechanism which was just signed between Vietnam’s Ministry of Industry and Trade and Germany’s Ministry for Economic Affairs in order to quickly remove bottlenecks for businesses while investing and doing business in the other country, she said. Prime Minister Nguyen Xuan Phuc hailed big German companies such as Siemens, Mercedes Benz, Bosch, Braun, and Adidas for making effective investment in Vietnam. However, he noted that Germany’s investment in Vietnam only stands at 1.4 billion USD, which is still modest to the bilateral potential. The two sides agreed to promote delegation exchanges and business presence at each other’s trade fairs and exhibitions to encourage German small-and medium-sized enterprises to invest in Vietnam. Phuc thanked the German Government for providing official development assistance (ODA) for Vietnam over the past years, which has made significant contributions to the Southeast Asian country’s socio-economic development. He proposed Germany further help Vietnam to implement projects on vocational training, climate change adaptation and waste treatment. Minister Zypries pledged to provide more assistance for Vietnam to carry out vocational training programmes.